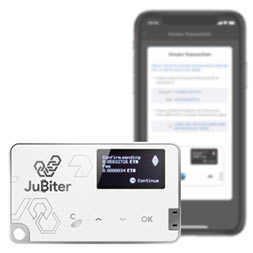 JuBiter Blade is the first model of JuBiter hardware cryptocurrency wallet product line. It is aiming to offer extreme security for protecting crypto assets without sacrificing much on usability. JuBiter Blade employs CC EAL6+ secure element working with dual data communication interfaces (USB + BLE) to offer secure cryptocurrency transactions for all major platforms. Dynamic CVC card is a member of FEITIAN Display Card family, it has an onboard electronic screen displays the CVC (Card Verification Code) that refreshes from time to time. Unlike fixed CVC, Dynamic CVC secure the credential by refreshing CVC, even if someone acquires a valid CVC by any means, it won't be usable minutes later, therefore reduces the chance of card fraud. © 2018 FEITIAN Technologies Co., Ltd.